Well, I have not updated in a while (what percent of blogs have a post starting with words like that?) Since the CONvergence post happened. Stuff like a Soul Caliber tournament held by Abby, Kyle moving to Florida, Darryl came back from Iraq again. My brother started college at MATC, and so did Tim. Bill’s mom got married and I was invited to the ceremony. I have also discovered the joy of Doctor Who (2005) and The Dark Night. I need to update more often, it is hard to remember a good story line for old events. At the SoulCal tournament I did ok playing Rock. Won a few matches. At Darryl’s homecoming party we had some great food, a lot of alcohol and some fun times. I ended up staying up till 7 or so in the morning with Carry’s husband Bill. Second time I have done that. I have discovered how cool the Glass Nickel is. This post is a bit of a mess/a list/rambling. But I am not sure how else to place it. Now to go draw something for an image to include. This entry was posted in Life and tagged Abby, Darryl, Florda, Glass Nickel, Iraq, Job, Justin, Kyle, Madison, MATC, Party, Soul Caliber, Tim, Unemployed on September 4, 2008 by Bryan Bortz. This weekend I was helping film videos of school down in Madison. Michael Sweet’s being was the biggest, and main one. We shot all of his stuff in the library. It was fun, but also long. We filmed from 4:30 into the night on Friday in the Library, and then more on Saturday for Sam at Ryan’s apartment. And since filming was happening on sunday too, and early in the mourning. I decided it would be helpful to stay in Madison to save time and gas money. So I stayed over at Sam and Kyle’s place. We finished up this weekend’s filming today (Sunday). The original reason I was around was because I was supposed to be in all 3 movies in some way or another. And I thought my parts were going to be filmed. It turns out we did do some of my stuff for Sam’s video on Saturday. But that was it. On friday I decided I would film the production of these films, Sam’s, Kyle’s, and mostly Michael’s. And they thought that was a cool idea, and over the weekend they became even more happy with the idea. So this means I have a video for class now: A documentary about the production of some of my classmates videos. I am not sure how much of a cohesive and interesting product I will be able to make out of it, but I will try my best. So far I have about 4 hours of footage from the 3 days. And will be getting at least 2 more hours, if not 4, from the rest of the shoots. I knew my parents had gotten me something. I knew this from talking to my mom on saturday about staying down in Madison. She mentioned they had gotten me something. I had no clue what it could be, and expected something like a new button-down shirt, or other clothing. 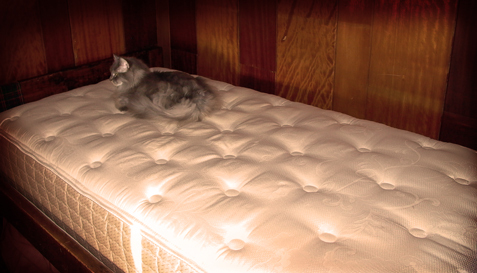 When I got home today from the 3rd day of shooting, I found a new Mattress in my bed with Kadie atop sleeping. Sweet, a new mattress. I can’t remember the last time I got a new one, and this one is soooo much nicer. I think I shall take a nap now. I did not sleep too well on Sam’s couch, twas too tall for it. This entry was posted in Life, School, video and tagged Behind-the-scenes, Film, Josh, Kyle, library, Life, MATC, Mattress, Michael, Movie, Ryan, Sam, School, short film, video, weekend on February 10, 2008 by Bryan Bortz.